Hello-Hello, it is a glorious fall day here at the Prepatorium, bright skies and sunshine abound, we hope it is the same in your corner of the world. We begin with an early look at some of the Lilly Pulitzer Furniture Collection, officially launched over the weekend. Clearly there is potential for some serious Pretty in Pink. As promised, the collection is alive with vivid colors. The new line is being created in partnership with HFI Brands. One of the more interesting pieces is an ottoman, seen in green and white below. The piece opens to reveal shoe storage. Gimmicky? Absolutely. Practical? Probably, especially for many Lilly Lovers, occasionally (cough-cough) in need of a bit more shoe storage. Also debuting next spring, the home decor and upholstery textile line by Lee Jofa. Both lines clearly hold promise, we look forward to seeing them on our next market trip. We send our thanks to Sophie Pyle for her generosity with the photos, to see more, click here. Next, word that another noted name is doing a line at Le Boutique Targét. 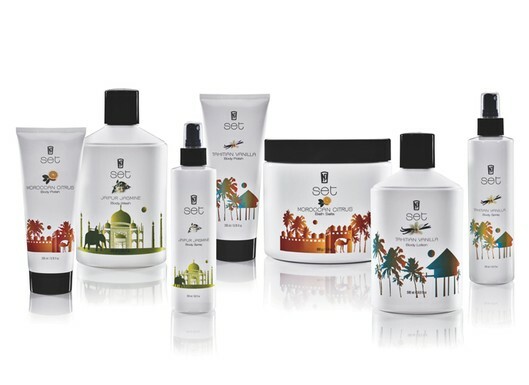 The creator of the Glossy Posse, cosmetics pooh-bah Napoleon Perdis, makes his move into bath products with his new line at Target. Women’s Wear Daily reports the line launches this Sunday. 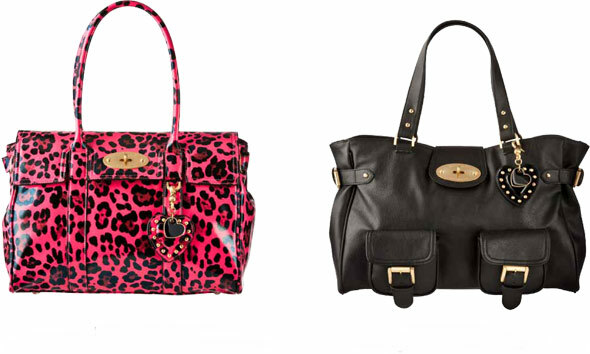 A reminder about another designer collaboration, the Target Mulberry collection arrived online and in stores this Sunday. Unfortunately every style online is sold out, one’s only opportunity to find the bags is at an actual store. We have a few notes to share, the first about our friend Tickled Pink & Green: her blog has returned to its original home at Blogger. A nasty humanoid has hijacked her URL and is holding it hostage for an insane amount of $$$. So pop in for a visit at this address, not the recent URL. Today is a good day for a visit, you can read about her excellent adventure with Hopsy at the Dallas True Prep event. Our other note involves OPB (Official Princess Business): Hanukkah falls early this year, so personalization deadlines are also early. We are excited about our Hanukkah and Christmas goodies from Clairebella, including Cutting Boards (seen above), Monogrammed Coasters, and Notecubes. We’ll also be sharing some of our Christmas goodies in this space, but wanted to be sure and get the word out on the cutoff date for most Hanukkah orders. 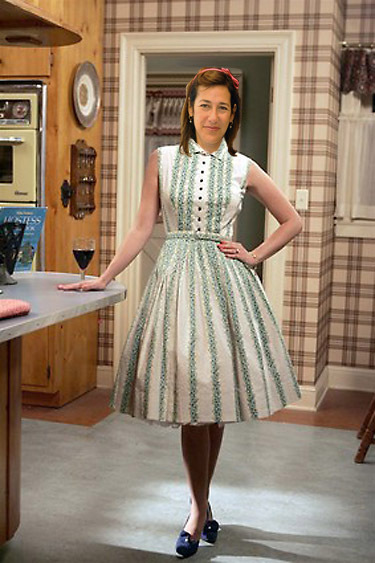 Finally, if wondering how the Mad Men cast celebrated Sunday’s season finale, many were at a watch party. 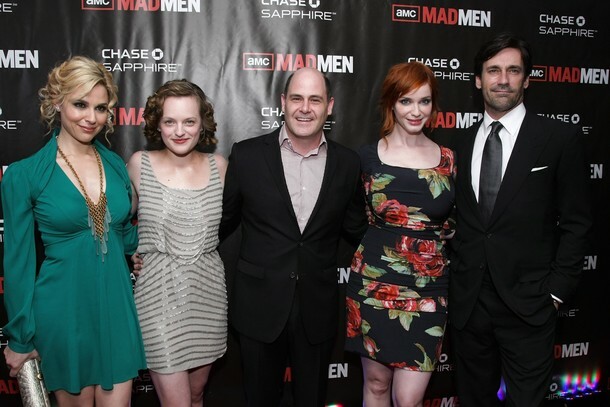 Above we see Cara Buono (Dr. Faye Miller), Elisabeth Moss (Peggy), writer/executive producer Matthew Weiner, Christina Hendricks (Joan) and Jon Hamm (Don Draper) before the big do at 21. Until next time,may your day be filled with sunshine. Hello-Hello, welcome to a Wednesday! We have more Fashion Week goings-on to share, beginning with last night’s bash, the Brooks Brothers True Prep party. 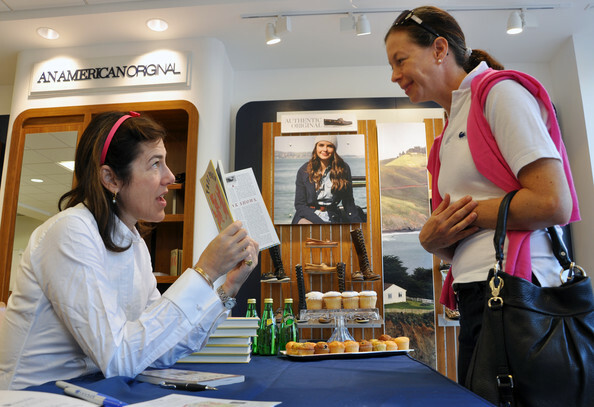 Authors Lisa Birnbach and Chip Kidd were on hand, madly signing books and looking well, preppish in Mr. Tschorn’s photos. For those recognizing Mr. Tschorn’s name, we have previously quoted from his stories in the Times, as well as his blog posts; he does a splendid job covering fashion and culture. 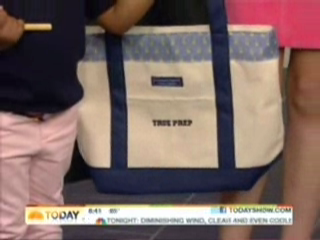 It sounds like the True Prep special edition at Brooks Brothers (previously mentioned in this post) was quite the popular item. To read Mr. Tschorn’s piece in its entirety click here; it will make you smile. 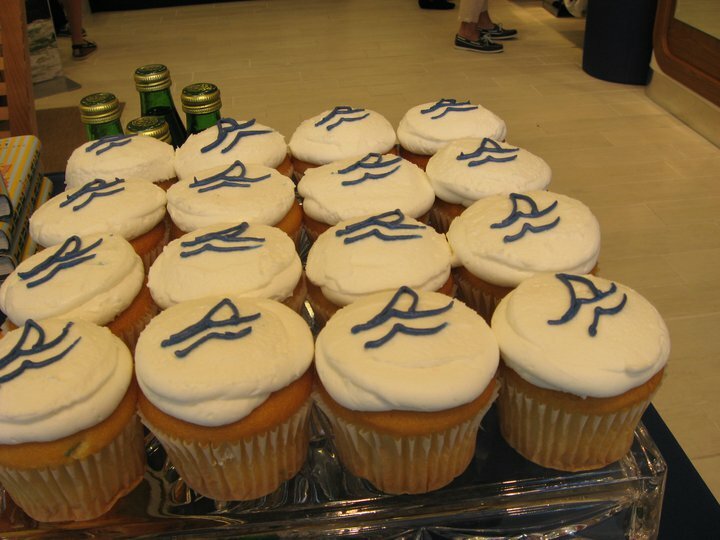 The scene is likely to be similar this evening at the Vineyard Vines party in Georgetown. That function gets underway at 6pm, showcasing not only the book and Ms. Birnbach, but also six new True Prep products. We have previously shown the Vines tie featuring the book cover’s Golden Retriever, Henry; that pattern is also used on the new Vines True Prep tote. Look for a fleece vest and several other co-branded items. Back to Fashion Week runway shows, a speedy glance at a label we love, Mulberry. We rarely feature apparel, generally we’re gushing chatting about the company’s handbags; here are a few styles from WWD’s brief review. Any company willing to put a pooch in a picture or two will grab our attention; the photos are all by Pasha Antonov via WWD. Nothing to make us gaga, but some lovely prints and stellar bags. Showing for the first time in New York, a Princess fave, Trina Turk. Some pieces were simply outstanding, with vibrant prints in rich, saturated colors. This also held true for the menswear, making us wonder if this is what a marriage of Lilly Pulitzer and Loudmouth Golf might produce…? As always, Ms. Turk presents some solid basics as well as pieces for fun and sun. We do enjoy much of Ms. Turk’s work, especially her home furnishings and accessories line. In keeping with our tradition of tracking those former faux-prep school students, we have a few Gossip Girl updates. More accurately, out and about mentions. ﻿﻿Above we see US Open champ Rafa Nadal with Blake Lively backstage at the Regis and Kelly show yesterday. The actress then headed to Boston to promote the opening of her film, “The Town”. 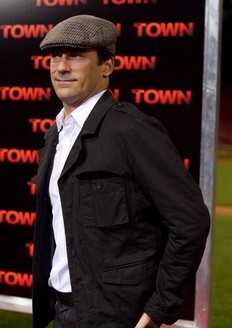 Also at the Fenway Park showing of the film, Mad Men’s Jon Hamm. What an amazing place to see a film! With that, it is g’bye until next time, when we look at the runway shows taking place today, Ralph Lauren and Tory Burch, among others. Hello-Hello, we hope everyone enjoyed a splendid weekend. As we previously mentioned, Fashion Week is well underway, and today we start with one of the original prep lines, Lacoste. This is the final collection for creative director Christopher Lemaire, the designer is off to Hermès. We continue to appreciate the clean lines and lack of frou-frou from this brand. Not all of the strongly geometric pieces felt right, either the proportions or fit or design just didn’t seem right. We do enjoy a bold graphic approach, and particularly the top in the center photo above. It is interesting to see the higher waist enjoy a continued return to prominence, for both men and women. Both looks seen above, and the styles shown below have solid elements. Overall the collection showed a lot of promise and we liked seeing models that were actually smiling on the runway, what a nice change. We are intrigued to see how Mr. Lemaire fares at Hermès. Also shown this weekend, Band of Outsiders, a line we have chatted about on several occasions. The presentation included a look at the new “Girl” line from designer Scott Sternberg, offering far more feminine looks than his “Boy by Band of Outsiders” collection. Below, a better look at two of those styles from the new line. And a few of the men’s styles. Back to the “Boy” collection. We move on, taking a look at the Kate Spade show, held Friday morning. We liked many of the looks captured by WWD (Women’s Wear Daily) for their brief review. Again, both looks have many appealing elements; the two final ensembles. Below we share a closer look at accessories, the pictures are via this post at Bloginity. We love the whimsical iPhone covers seen above, and both of the items seen next, they also definitely have a retro flair. And two more bags via Bloginity. The promotion offering an additional 25% off sale priced merchandise ends tonight at midnight. Many readers are fond of Gossip Girl (or the fashions shown on the program), making its reappearance tonight. It was a busy weekend for many of the stars, with several attending Fashion Week functions. Below left, Ed Westwick at the Tommy Hilfiger show, and on the right, Chace Crawford is seen with Naomi Campbell at the Fashion’s Night Out event held at Dolce & Gabbana. Another star, Blake Lively, was at the Toronto Film Festival for the première of her upcoming movie, ‘The Town’. Left, Ms. Lively at a news conference and on the right, at the screening. A few quick True Prep notes, starting with authors Lisa Birnbach and Chip Kidd signing books at the Bloomingdale’s FNO event (there are loads of photos on the True Prep FB page). Also, Brooks Brothers is devoting a new section of its website to the recently released book. The special edition True Prep tie from Vineyard Vines is now available online. We do think Henry (from the crest on the book’s cover) looks rather distinguished in silk. Sadly, there are grumblings from some quarters; evidently others here at the Prepatorium think they should be showcased in silk. Silly Tilly in silk? We think not. 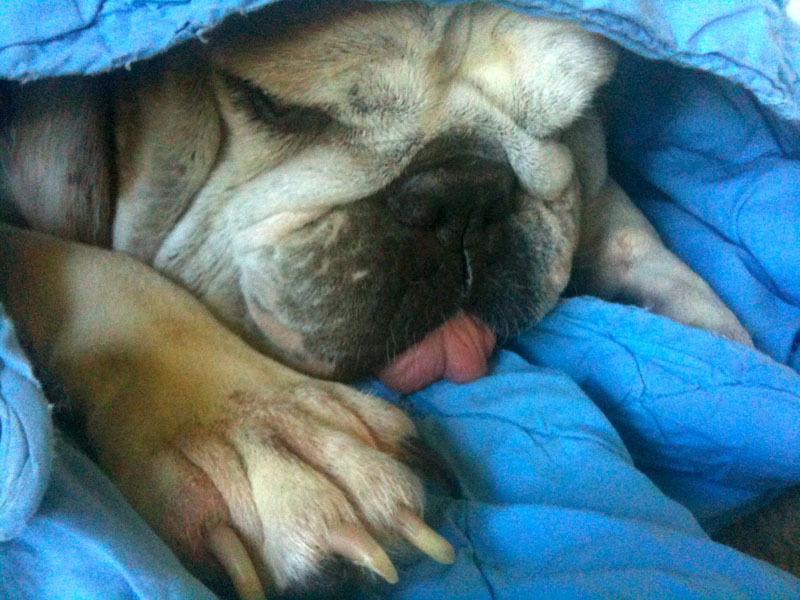 Doubtful; somehow her blue blankie diminishes the dignity factor. On that goofy look, we say g’bye until next time! Hello-Hello, doesn’t it feel like time for some Friday Fun? We are thinking this could be the theme for today’s post, we’ll steer our path away from anything serious or weighty, and have a look at Fashion Week, Fashion’s Night Out (FNO), Gossip Girl’s ‘fashionable new season,’ as well as the Brooks Brothers and Lilly Pulitzer ties to True Prep. We begin with FNO, for where else would one see this trio? Anna Wintour, Blake Lively and Roger Federer were on hand Wednesday night for what was billed as the largest public fashion show in history (a quick sellout at $250 per ticket), held at Lincoln Center. The function was also taped for a one-hour special airing at 10 Tuesday night on CBS. Ms. Lively’s co-star, Leighton Meester, was also in attendance. It has been a busy week for the young actress, earlier Tuesday she was at the J. Crew/People StyleWatch screening of “The Romantics”. Katie Holmes and Tom Cruise also were at the private showing; we chatted about the J. Crew product placement in the film in this post. Back to Fashion’s Night Out, London’s FNO is already in the books. Below left, the Burberry celebration featured models Rosie Huntington-Whitley (L) and Daisy Lowe (R) on either side of Burberry’s creative director, Christopher Bailey. The photo on the right shows Claudia Schiffer, also on hand for the Burberry party. On this side of the pond there are multiple FNO events with a preppish flavor: J. Crew’s Jenna Lyons will be at the company’s Prince Street store, while Jessica Alba and Andre Leon Talley will be at the Polo Ralph Lauren location in Soho. Brooks Brothers’ FNO party starts at 6pm at the flagship store on Madison; we don’t know if they will have the Brooks Brothers True Prep limited edition available, but it can be purchased online at the retailer’s website. Lilly Pulitzer co-hosts a True Prep event at Bloomingdale’s, both Lisa Birnbach and Chip Kidd will be on hand to sign books, there is also a very-limited-edition True Prep Lilly polo shirt, the words “True Prep” are visible when one ‘pops’ their collar. We move on now, to Fashion Week. Some shows have already taken place, like Jessica Simpson’s, held Wednesday; the entertainer launched her new denim line. Christian Siriano showed yesterday, below a sneak peek at some of his shoe styles for Payless. 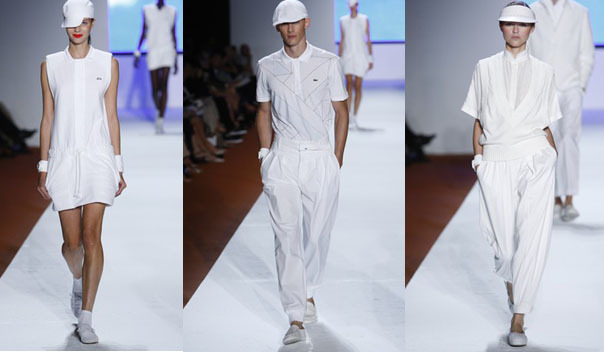 To see all of the designer’s looks from his Spring 2011 collection, click here. If curious about the lighter, summery looks, a reminder the styles being shown are for the spring 2011 RTW (ready-to-wear) season. Shows we are interested in for today, Kate Spade, Steven Alan, and Ports 1961. Tomorrow’s schedule includes the Lacoste and Band of Outsiders shows, Monday we have Caroline Herrera and Marc Jacobs, Tuesday’s offerings include Karen Walker and Mulberry, while Wednesday is shaping up to be insanely busy with Tory Burch, GANT by Michael Bastian, Michael Kors and Milly, to name just a few of the shows. The big week wraps up Thursday, with collections from Ralph Lauren and the master, Oscar de la Renta. The run-up to Fashion Week is always chock full of parties and this year is no different; one of the most coveted invites was for last night’s re-opening of Chanel’s Soho boutique. Below, Chanel Grand Pooh-bah Karl Lagerfeld and once again, Ms. Lively. It was quite the do, other guests included Sarah Jessica Parker, Liv Tyler, Claire Danes and Diane Kruger. One other event to mention, this one taking place next weekend (and completely unrelated to Fashion Week or Gossip Girl! ), but sure to be fun and for a good cause, Baltimore’s first annual Oxfords and Oysters. Below, a sampling of the logos from sponsors and those donating goodies for the VIP Guest bags, definitely a preptastic group. The philanthropic soiree benefits the Oyster Recovery Partnership, working to restore the oyster population in Chesapeake Bay. Our pal Jennifer at Sky Blue Events is in charge of the celebration, and several of our blogging friends are attending, we wish we could temporarily relocate Princess InterGalactic HQ to Baltimore so we might go too! Actor Jon Hamm was named International Man of the Year. Also being honored, Gossip Girl star Ed Westwick, recognized as “Breakthrough Talent of the Year”. Likely to also be of interest to Preppy101 a certain favorite blogger, Mr. Hamm’s appearance Thursday at the Venice Film Festival. Also seen in this photo, co-star Jeremy Renner, director Ben Affleck and actress Rebecca Hall, the group is promoting their film “The Town,” opening September 17.
the latest collaboration for Gap is with (this is amazing) Valentino! don’t forget that Tucker launches at Le Boutique Targét on Sunday. Until next time, may everyone’s weekend be filled with sun and laughter. Hello-Hello, welcome to a Wednursday (Wednesday + Thursday) post, we are so swamped this shall have to count for two days. 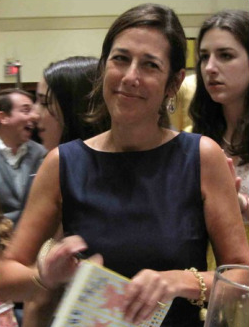 Today we share our interview with the woman we call the Grand Pooh-bah of Prep, Lisa Birnbach, the author of True Prep. Yesterday was the book’s official release date, and we still cannot believe she found time for an interview; some readers may recall Ms. Birnbach’s day started with an appearance on the Today show, and it only grew busier after that. Almost all of the jewelry was on loan from Verdura, including the Beehive Pendant Watch, not unlike the one shown below in a 2007 Christie’s catalog. Verdura is covered in Chapter 4, “I Just Found it in My Closet,” sure to be a favorite for most fans, as it covers the contemporary sartorial choices one confronts in clothing and accessories. Ms. Birnbach explained a bit of the process for borrowing the jewelry, it is not something undertaken lightly. As mentioned, not everything was on loan, the pinky ring worn by Ms. Birnbach was her own, marking the occasion of her son’s birth. We only had one other matter to handle before getting into the meat of the interview, a minor issue we felt compelled to discuss before we could comfortably move into more intense conversation. “The women’s Original 2-Eye metallic boat shoe seen below is at Crew, offered in platinum. There, enough of that tedious blather the background, now back to yesterday’s conversation. Ms. Birnbach was gracious in responding to our angst about the shoes. Of course that exchange was understood by both parties as being in jest. Fun. Funny. Entirely couched in humor, intended to be taken as such, and returned in the same vein. And Ms. Birnbach is *very* funny, immediately grasping the enormity of a “Princess tragedies” on the level of a metallic Top-Sider. This was helpful, allowing us to feel safe bringing up the next crisis. During the interview we had a splendid talk about the breadth of choices available these days when looking at clothing and accessories, from relative newcomers like Smathers and Branson or Tucker Blair for needlepoint goodies, or Vineyard Vines, to old standbys like Brooks Brothers and Lilly Pulitzer. The number of bright, gifted entrepreneurs now making things appealing to preps of all ages continues to grow. The writer shared a story about her own preppy look from years ago when she had one of her very first jobs in the business, this one at the oh-so-liberal (the horror) Village Voice newspaper. As might be expected, the style was très casual, everyone dressed down. Way, way down. What was a prep to do? Ms. Birnbach went wild, and purchased a Lacoste polo shirt. In black. No one will be surprised to learn we had fun talking about the Anti-Prep Wall of Shame, we sensed unspoken approval of our existing members. For the uninitiated, this select group includes both humans (think Paris Hilton), as well as other entities (Abercrombie & Fitch) displaying gross negligence to standards of good taste, good manners, or basic decency . The conversation moved on to the sorry state of what passes for “celebrity” these days. We talked about the challenge of writing True Prep. It was not easy, the enormity of following an iconic book like The Original Preppy Handbook was more than daunting. “It is scary to come out with this book, it really is. The writing part itself, the sitting down and typing the words actually wasn’t the difficult part… it was the going through the day, trying to look at every single thing that could have changed in the last thirty years…that part was hard. I hope people have fun with it, I hope they enjoy it, I always worry. We also chatted about what I perceive as the challenge of the upcoming book tour and other public appearances, almost everyone approaching with a “Why didn’t you include _____________________ in the chapter on preppy colleges?” Or, “I cannot believe you think that _______________ is preppy.” Miss Birnbach explained that she is not saying absolutely, unequivocally, that a certain school, or community, or club, or sport, or item of clothing, or anything else is the “one and only.” Nor that it should be. And she also said she learns an awful lot when from questions and comments, she very much sees the process as a learning experience. It is very much like the witty irreverence found in TOPH back in 1980. As far as we’re concerned herein lies the crux of the interview, as well as the new book, the old book, and the entire topic: this is not meant to be taken seriously now, nor was it ever intended to be. A simple look at the book’s classification makes things clear. The quality that makes something laughable or amusing; funniness: could not see the humor of the situation. That which is intended to induce laughter or amusement: a writer skilled at crafting humor. In wrapping up the conversation Ms. Birnbach mentioned the possibility of another gabfest at some point in the future, something we would enjoy enormously. She is much more than fun, and bright, and sophisticated, she is simply a delight to spend time with. Perhaps the best way to understand Ms. Birnbach is through her simple post last night on the True Prep Facebook page, an example of very few words saying quite a bit. One quick note before leaving, if there are questions you might have for Lisa, do leave them in a comment; we’ll gather them up in a bit and put them aside for a future (cross your fingers) conversation with Ms. Birnbach in the next few months. Again, our thanks to Lisa Birnbach, and also to Sara at Random House, they made things fun.